Young Drivers learn about the ripple efect. The annual driver safety program for Mudgee High School Year 11. students at the PCYC on Friday, Foreground. from left) Midget Rescue Squad President Geoff Hawes, Jess Loveday from sponsors Elders Insurance, Phillip Blackman of the Mudgee Rescue Squad, Constable Anne Marie Costello, Colleen Holland of the Mudgee Rescue Squad, Year 11 Year Advisor Melissa Date, Wayne Joseph of the Mudgee Rescue Squad, Senior Constable Brett Paulson and John Wade of Wheelchair Sports NSW (front). 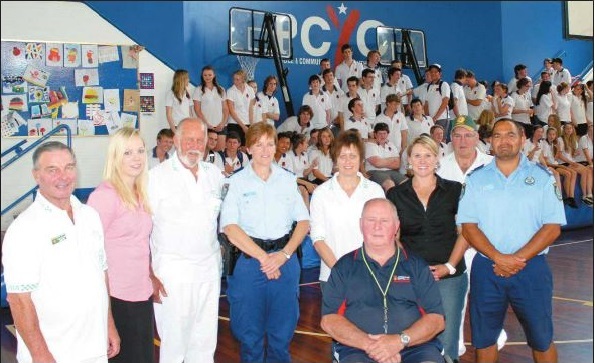 Year 11 of Mudgee High School was given a lesson in safe driving and responsible road use at the PCYC on Friday. The Rescue Squad presenta­tion started with road statistics as a way of generating discussion before getting into a video asso­ciated with P-plater driving habits. Colleen Holland talked about her experience of losing her son in Rally a car accident and the rip­ple effect of such a tragedy. “It’s something you can’t get over with a night’s sleep, it’s something you have to learn to live with,” she said. And it effects more than the family and friends but also those who are there, the ripple just keeps going. The Police presentation focused on the three main causes of motor vehicle accidents; Speed, alcohol and fatigue. Constable Anne Marie Costello and Senior constable Brett Paulson reminded the young drivers of their obligations as road users. They said that drivers have a responsibility to themselves, other road-users arid to their passengers, and to keep them safe. Also when they are passengers with a driver who is behaving irresponsibly they need to speak up.